I've written before about this nice, no, awesome TC Helicon vocal/guitar processor with a hefty name: Voicelive Play GTX. There is an optional 3-pole footswitch to control the oh-so-many options in the processor. The company is kind enough to provide the diy customer with the schematics to make his/her own footswitch. I already made one, but it turned out to be too small and light weighted to take all the tramping action. In addition, as I thought would happen, the plastic switches couldn't hold their own in use. 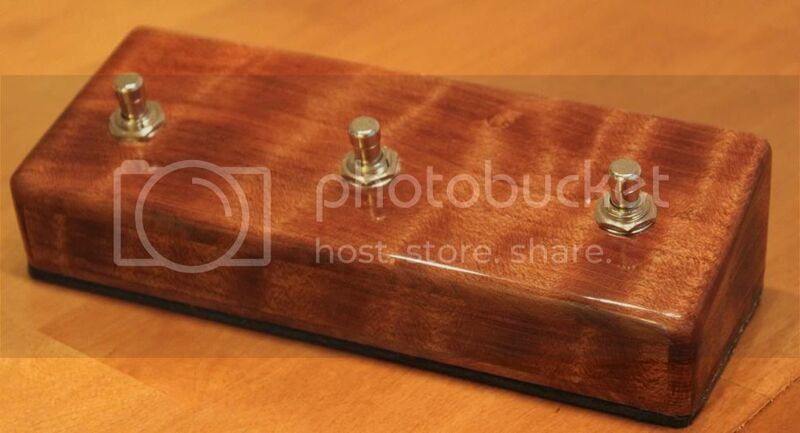 So, back to the bench, I ordered three rugged metal momentary switches and made the prototype #2# out of flamed redwood that never made it to be a top of a guitar. This time I made it wide enough to accommodate toes or shoe tip on one button without pushing the others, and deep enough to prevent the box from tipping when pushed. It's working like a charm and looking WAY better than the usual black metal box design. You can program this optional footswitch to do a plethora of things. 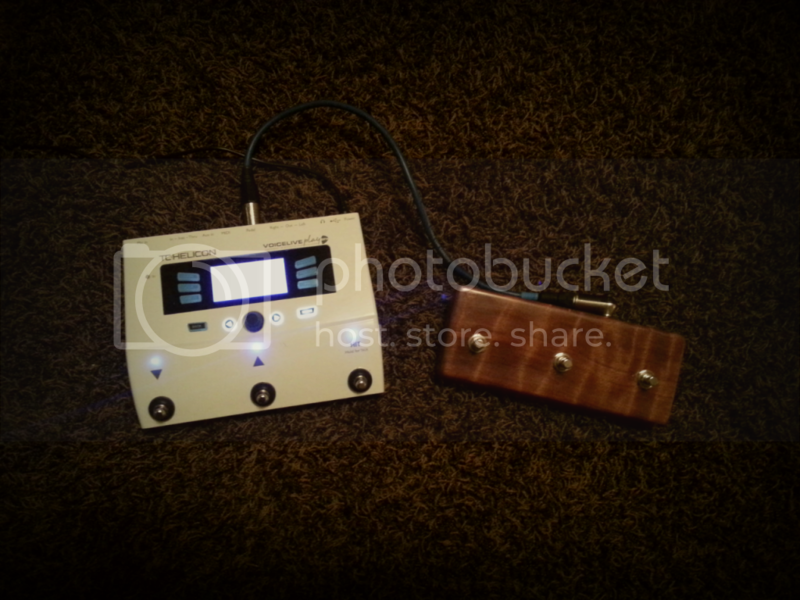 Turn on and off different vocal effects and harmonies, set tap tempo, give looping commands, boost guitar and effects etc. I wouldn't be surprised if you could even make some coffee with it. The setup is a very basic wooden box with slanted roof. The intestines were soldered and attached before the bottom plate was glued in. A layer of foam from what used to be a mousepad keeps the thing from surfing around.